Howdy! I am still making torn fabric strip crafts. Today, I made a 12-inch wreath. The wire wreath form I used is 12 inches wide, and has 4 rows of wire. I tied the fabric strips, ribbons, and trims, to all four rows of wires, making this wreath full and simply beautiful! For the fabric part, I used three different pink pattern fabrics, and two different purple pattern fabrics. The fabrics used, measures almost a whole yard. I also added some ribbons and trims, to help convey the feminine, shabby chic, and vintage style of this hand-torn fabric wreath. 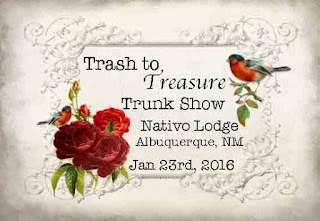 I used over 25 yards of ribbons and trims. I added pink and purple seam bindings. Along with a chevron pattern cotton ribbon in both pink and purple. I added white lace and white velvet ribbon for softness. And finally, I added pink glitter tulle and silver-trimmed pink satin ribbon for sparkle. 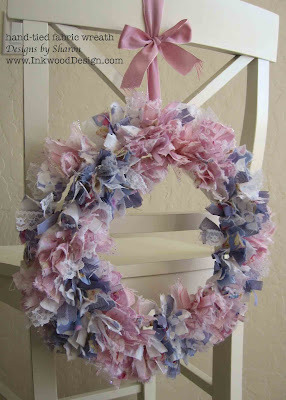 Finally, I added a yard of this beautiful wide (1 1/4-inch) rose-pink ribbon to hand this beautifully sweet fabric wreath, to provide you with a way to hang this wreath. This gem of a wreath will look perfect hanging at your next tea party, sweet 16th birthday party, or that very special first birthday celebration! This pink and purple hand-tied fabric wreath will add the perfect final touch hanging at a cake table for your next big event: wedding, engagement, retirement, or special birthday celebration. 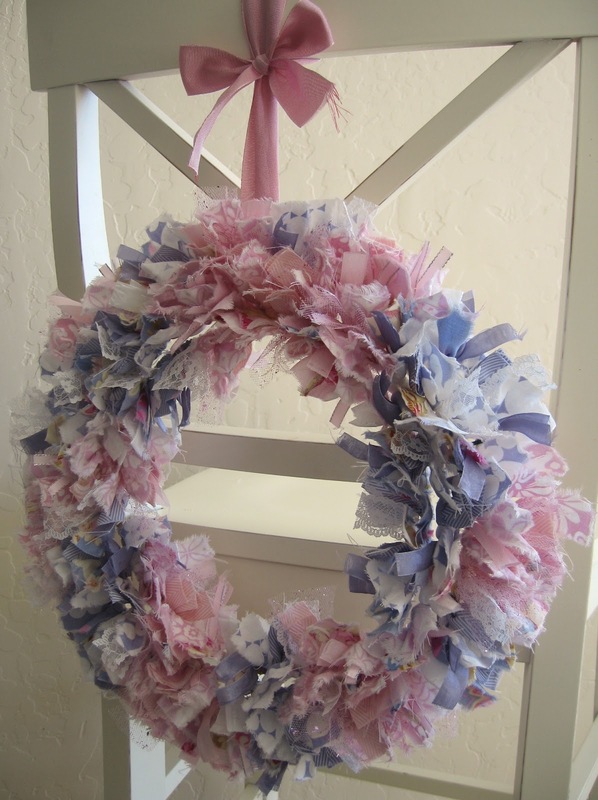 You can purchase this one-of-a-kind hand tied fabric strip wreath HERE . If you would like me to create a one-of-a-kind, fabric strip wreath for your next celebration or for that perfect final decor item for your newly decorated room/home, please contact me with your requests: size, color(s), and materials. Or simply come out to the Trash to Treasure Trunk Show next weekend, to see my creations in person.